At PURPLE TULIP FLORIST INC., we deliver smiles from across the miles! The Purple Tulip Florist is a locally owned and operated florist serving and delivering to all of Santa Rosa and Escambia counties. Katherine Folzman, owner and certified Florida State Master Designer, was born and raised in Milton, Florida. Her goals for The Purple Tulip Florist are to provide friendly and competent service to everyone in town and around the world. And to promote a Christian environment where friends and customers alike can come and feel confident that we will do our best job. The Purple Tulip is actively involved in the Northwest Florida Floral Association, a training group for the panhandle florist community. We are also a member of the Florida State Floral Association. These associations keep The Purple Tulip and its designers current on the latest flower design trends and continuing their design education. The Purple Tulip is a proud member of our Tri cities BNI group. 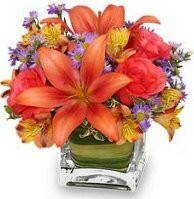 It is our pleasure to assist you with any occasion you need flowers for. We will work with you, turning your ideas into reality, helping you express your feeling with flowers. All while working with your budget. We hope you enjoy your online shopping experience with secure 24-hour ordering right at your fingertips. If you prefer to talk to a real live person, give us a call and place your order at 850-983-3600. Same day delivery available! Thank you for visiting our website with flowers delivered fresh from your local MILTON, FL flower shop and convenient online ordering 24 hours a day!